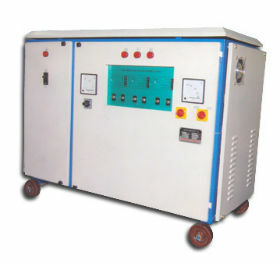 Air cooled Servo Voltage Stabilizers are used for various electrical and electronic applications. At Nantech Power Systems, the best Servo Voltage Stabilizer dealers, we offer high grade Air Cooled Servo Voltage Stabilizer which is designed using with latest technology. With the latest electronic circuitry, Nantech Servo Stabilizers are extensively used to control the power to any critical equipment which could get affected by voltage fluctuation. Our efficiently designed voltage stabilizers are made using premium quality raw materials and are known for low power consumption, heat reducing capacity, and trouble free operation. These also have a compact design and give a constant output for the application with stability 98% efficiency and more. We offer customization facility for all the products as per the client’s specifications and also we provide them at very competitive prices. Our air cooled stabilizers range up to 100KVA. Under Voltage cutoff Protection through contactor. Short circuit protection through MCB. Reliable Performance and trouble free operation. Customized solution available on request.